Freddy Krueger returns to deliver a whole new breed of terror in his most fiendishly perverse fright fest yet! 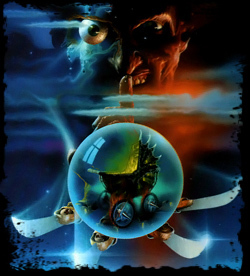 Unable to overpower the Dream Master who vanquished him in A Nightmare on Elm Street 4, Freddy (Robert Englund) haunts the innocent dreams of her unborn child and preys upon her friends with sheer horror. Will the child be saved from becoming Freddy’s newest weapon or will the maniac again resurrect his legacy of evil? For this eye-popping installment, director Stephen Hopkins (Lost in Space, Predator 2) enlisted makeup wizard David Miller (The Terminator), original creator of Freddy’s hideous visage. The result: a face that not even a mother could love, and terror beyond your wildest nightmares! UK: Congratulations It’s a Nightmare! UK: Freddy’s Giving Birth to a Brand New Nightmare! Home Video: It’s a Boy! Home Video: Now Freddy’s a Daddy… He’s Killing for Two. Home Video: Evil Has Spawned.